The reception is one of the most fun parts of the entire weekend. Couples look forward to this event the most. They get to finally let loose and party with friends and family. You have to set the right tone for the night. If you are excited and energized then people will feed off that energy and do the same. Your bridal party's entrance plays a big role in the vibe for the night. There a number of ways the bridal party can make their entrance by coming in dancing and singing the words, some have choreographed moves, and some come in smiling and waving. Whatever your preference, pick a song that is upbeat and the crowd can clap along too. 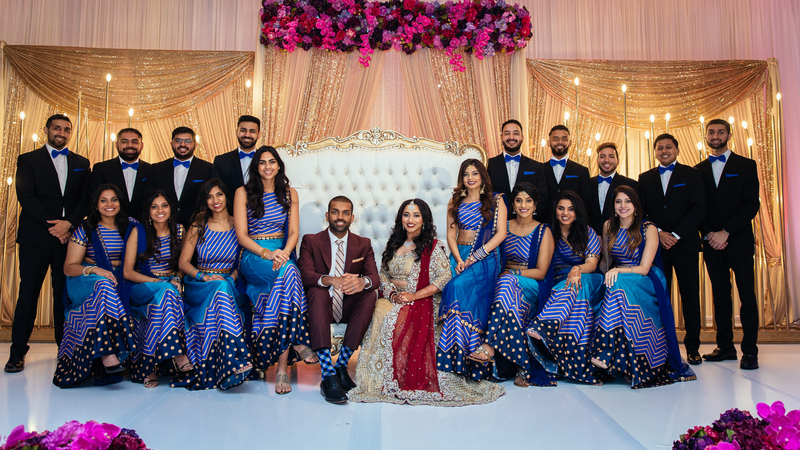 Most of the time the bridal party is choosing American songs for their entrance, but we wanted to give you a mix of Indian and American songs for their entrance. We have seen many weddings where the bridal party either use these songs or consider using these songs. The following Top 15 Indian Wedding Reception Bridal Party Entrance Songs are ranked based on what we have seen used most often within the last few years. The Top 15 Indian Wedding Reception Bridal Party Entrance Songs begins with a hype track from DJ Khaled. In the last few years, we have seen this being considered most often. Don't be surprised to see this song at the top of the list, for a long-long time. DJ Khaled put an all-star team on this track and it keeps everyone hype every time it's played. Fill out the form on this page and we will send you an email with all these songs on a playlist. If you need instrumental music for a brides ceremony entrance, check out our blog. This epic song is a party starter and a great way to make an entrance into a reception and that's why it made the Top 15 Indian Wedding Reception Bridal Party Entrance Songs list. You know it's time to party when this song is heard. We've seen a lot of bridal parties enter to his track by Badshah. Fill out the form on this page and we will send you an email with all these songs on a playlist. If you need a song for a brides ceremony entrance, check out our blog. Drake is a phenom in the music industry. You knew sooner or later his tracks would reach the Top 15 Indian Wedding Reception Bridal Party Entrance Songs list. It's a great song to vibe your way through the entrance of a reception. This is played at almost every Indian wedding in the last two years.. If you need a DJ for your wedding that knows music and will take care of, contact us here. We've had the pleasure of DJing private VIP experiences right before Bruno Mars' concerts at the American Airline Center in Dallas and have seen how many people love his music. Bruno Mars has taken over Pop ever since he began his musical career. This song is such a big hit, it has become an anthem that everyone sings along to. Imagine jamming to this song once the doors open when the bridal party makes their entrance. Fill out the form on this page and we will send you an email with all these songs on a playlist. If you need song for a grooms ceremony entrance, check out our blog. The fifth spot on the Top 15 Indian Wedding Reception Bridal Party Entrance Songs list goes to Zack Knight's biggest hit. The original Bom Diggy made it's debut in the Bollywood world in 2017 but then was used in a movie in 2018 for Sonu Ke Titu Ki Sweety. A majority of the weddings we do, will have this song played somewhere (usually for the dance floor). Fill out the form on this page and we will send you an email with all these songs on a playlist. If you need a vidai song for the wedding, check out our blog. Fat Joe made it to the Top 15 Indian Wedding Reception Bridal Party Entrance Songs list? Not what you would expect, but with a little help from French Montana here this song is. Fat Joe had some hitters in the early 2000's and now he's back with a fire song. If you want to come in singing and dancing, this will be a contender. If you still need a DJ the knows music and will make sure everyone has a great time, contact us here. Varun and Alia make their first appearance on the Top 15 Indian Wedding Reception Bridal Party Entrance Songs list. This is one of the most popular wedding songs of the decade. Almost every wedding has either used this for a performance, entrances, or on the open dance floor. Fill out the form on this page and we will send you an email with all these songs on a playlist. If you need a bridal party entrance song for your wedding, check out our blog. This insane track was released in 2013 and it's been played at 99% of Indian Weddings. Also keep in mind, that the best parts of songs should get played for entrance. This is usually not at the beginning of the track. A good DJ will know where to start and end songs for entrances. Fill out the form on this page and we will send you an email with all these songs on a playlist. If you need a wedding planner, check out our blog. Everyone getting married right now listened to this epic song by Usher. The song came out in 2004 so what better way to remember the good old days than with this throwback track as an entrance song. When the bass hits on this song everyone immediately know what time it is. PARTY TIME. If you still need a photographer, check out our blog. The 10th place on the Top 15 Indian Wedding Reception Bridal Party Entrance Songs list goes to Anushka and Ranvir. This song has wedding celebrations written all over it. If you choose to use this song, make sure your DJ knows where to start the track from. Find the chorus or the most hype part of the song. If you need a sangeet entrance song to come into with your partner, check out our blog. Nothing says the word "Love" than this song by Chris Brown. Forever starts at the wedding day and what better way to begin the night than with song for your bridal party entrance. Couples and bridal parties these days love sing along songs more and more and this is a perfect song to sing along to as their epic entrance is made. Fill out the form on this page and we will send you an email with all these songs on a playlist. If you need a decorator, check out our blog. Top 15 Indian Wedding Reception Bridal Party Entrance Songs list features Yo Yo Honey Singh for the first time in this blog. We knew he would make it eventually. As newer songs came out, this one took a back seat. Its still a good song and can be used for people who haven't heard this song in a while. Fill out the form on this page and we will send you an email with all these songs on a playlist. If you need a song for your bridesmaids' entrance for the reception, check out this blog. The Top 15 Indian Wedding Reception Bridal Party Entrance Songs list brings out an EDM song that will make you feel the beat in your heart. Major Lazer has grown more into the Pop and Hip Hop scene in recent times which has grown his popularity. It can definitely be a contender.. If you need a videographer, check out our blog. Some songs will never lose their luster. Here's a song that will be sung at every Indian Wedding. No matter young or old this song definitely speaks out. We've seen many bridal parties enter to this song waving their arms up while the crowd cheers them on. Want to make your wedding unique, check out the top 3 weddings vendors you didn't know you need. The Top 15 Indian Wedding Reception Bridal Party Entrance Songs list ends with a song featuring Ed Sheeran. This song has the right lyrics and tempo. Ed Sheeran is known for singing love songs but this song really does get everyone excited. If you still need a song for your main couple's entrance for the reception, check out our blog. A wedding is the happiest moment in your life and you should choose music that you love. Over our 25 years of bringing joy to thousands of couples, the DJ Riz Entertainment team has helped many couples find the songs that help them create memories for a lifetime. The Top 15 Indian Wedding Reception Bridal Party Entrance Songs list was made to help busy couples that don't have time to find the best music for their big wedding weekend. If you or a friend needs an Indian wedding DJ that will take the time to understand what you need and help make your wedding weekend perfect, contact us here for more information on our services.